IMR, Inc.’s partner company, David A. Keener, Inc. (DAK), was established in 1971 as a used equipment dealership. The general office for the business is located in Hayden, Indiana, approximately seven miles east of Interstate 65 Exit 50A. Storage facilities are located in Hayden and Scipio, Indiana and McMinnville, Tennessee. DAK specializes in the sale and purchase of used metal stamping and forging equipment. We always have a large independent inventory of equipment available for sale. In addition, we are interested in purchasing your surplus equipment. DAK personnel can be your strong ally, helping to identify the right equipment which will do the work that it’s designed to do and meet your needs. We will also provide a search for that special requirement or perform an inspection on a press you are considering. DAK partners with Industrial Machine Repair (IMR, Inc.) to provide rebuilding services. Needing a used replacement part? DAK maintains a large inventory of used component parts for sale. Let us help you with your equipment needs. Just give us a call. David A. 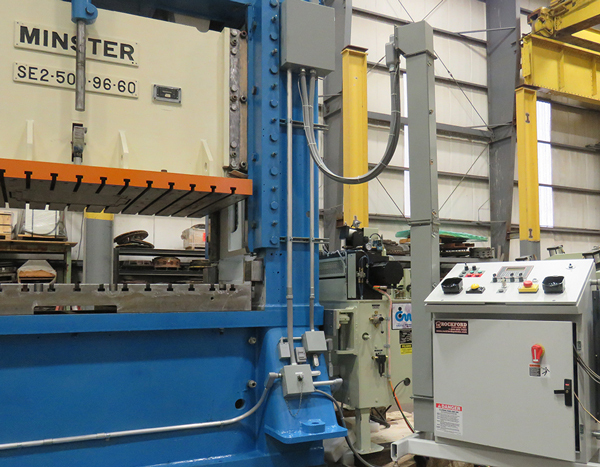 Keener, Inc. stands behind our equipment, including offering a year warranty on every press we rebuild and six months on every reconditioned press.